I was very pleased with my new discovery today when a friend took me to Himawari Japanese Restaurant in Alexandra. I have been working nearby Alexandra for over a year now and did not even realize this restaurant existed! It is apparently well known for the office lunch crowd, though it is tucked away in one of the office buildings and a bit difficult to spot. The place serves several set menus which change daily. 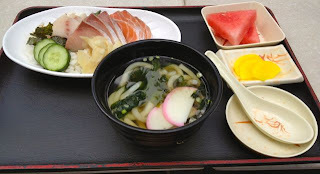 I had the Salmon Makajiki Hamachi Don Set Menu (SGD 21.80). The noodles served were cooked perfectly with just the right amount of chewiness. The sashimi was really fresh, and the japanese rice served under the fish was excellent. Himawari has other set menus available priced at SGD 12.80 for a fried variety while others priced at SGD 18.80 for teppanyaki dishes. I was delighted with this new restaurant find and even more pleased that pricing is decent as well. Definitely will make an effort to walk here for lunch every so often. A big Thank you for the well comments! Do come back and visit us again. Our A La Carte buffet is really nice, do invite your good friends to come and try! and it has a function room with Karaoke facilities. Currently, there is a promotion going on at Changi Branch for buffet dinner. 1 Free with every 3 paying. Hi, in case the Himawari management does not respond to you directly... I believe they serve pork since I've seen katsudon on their menu. Hope this helps! Hi, yes I will drop by again soon. I am not a big buffet eater but will try your other ala carte items. Hi Fash Boulevard, thanks for stopping by. Just followed your blog as well :) Loving the fashion tips.